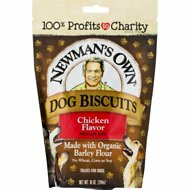 Newman's Own takes premium treats one step further with their Chicken Flavor Small Size Dog Treats. 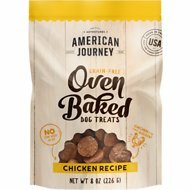 These scrumptious treats are made with natural and organic ingredients that are high in protein, naturally preserved and contain no wheat or corn and no artificial colors or flavor enhancers. Plus, they are also free of added hormones, antibiotics and chemical additives because your pup deserves nothing but the best! Made with chicken and organic ingredients like barley flour, carrots and apples. Organic Barley Flour, Chicken, Cane Molasses, Organic Carrots, Organic Apples, Chicken Fat (Preserved with Mixed Tocopherols and Lecithin), Rolled Oats, Rosemary Extract. We have a 10 year old pom. She is very small and these treats are just get size. Both of my dogs love these and they are the perfect size for my toy poodle. 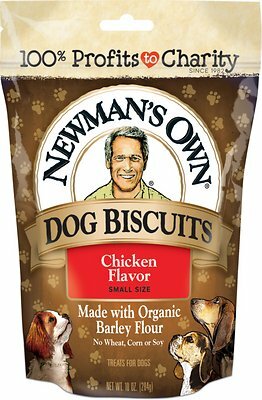 Newman's Own is a name I can trust. Healthy and low cal, but not something that pup would care about. Generally, the product has been very good. The last batch I received were starting to go stale. On top of that, somewhere along the line the treats got broken up and crumbled somewhat. My Don never eats crunchy treats! 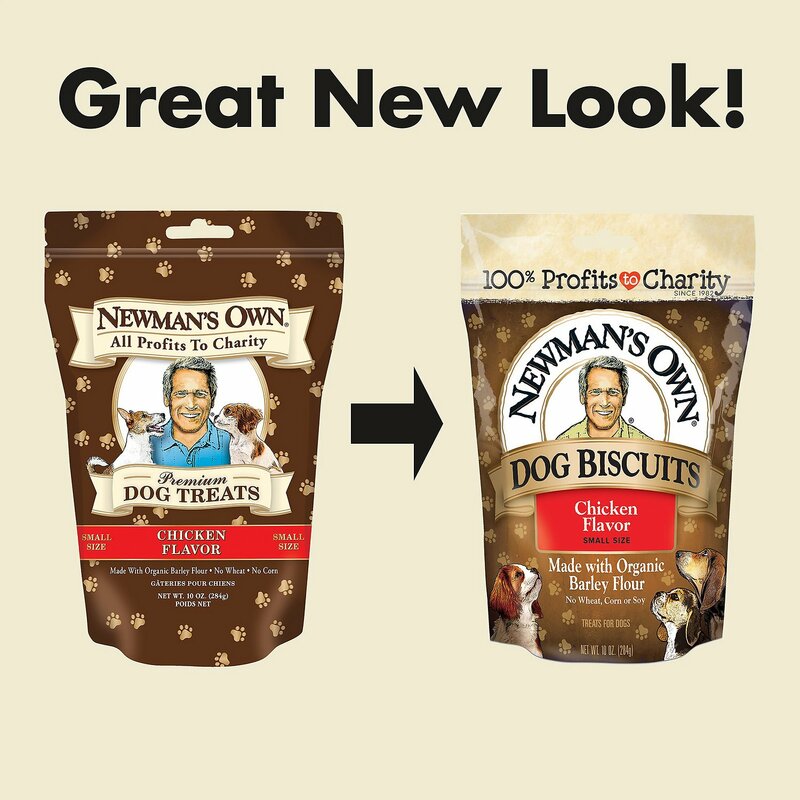 Lucy always turns her nose at crunchy treats, favors the soft ones, but loves these! 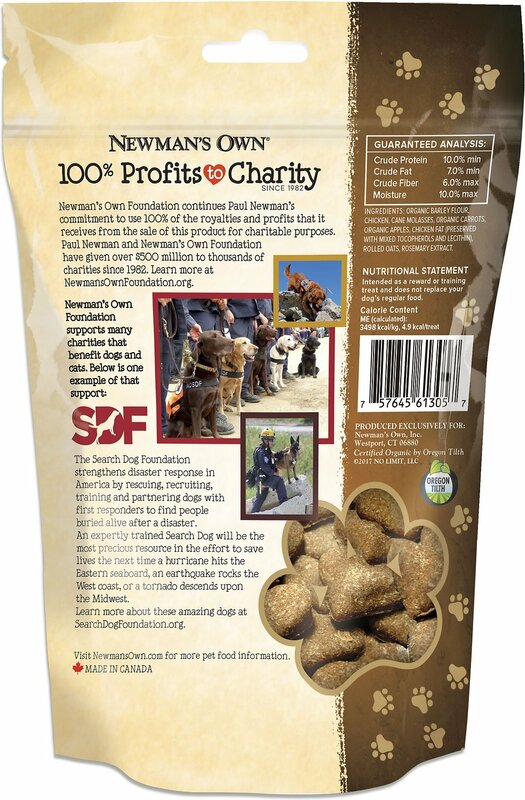 Can't beat that Newman's donates proceds!! I have a small dog (18 pounds) and as my vet says, small dogs are fussy eaters. That includes treats. So I hesitate to buy treats he has not had the opportunity to sample, since he refuses so many or once they are in his mouth, only places on the ground. But these he loves. We are both pleased! My pooch was not impressed. She has a variety of treats so I will use these for company! !